Female Field cuckoo bumblebee (Bombus campestris). Photo credit: Colette Miles. A widespread species of cuckoo bumblebee, with no particular habitat preferences. Like all cuckoo species, they do not collect pollen for their offspring (and so have no pollen baskets or worker caste), but instead take over the nests of carder bumblebees, mainly the Common carder bee (Bombus pascuorum), but also probably all four scarcer carder species (Brown-banded carder bee, Bombus humilis; Moss carder bee, Bombus muscorum; Red-shanked carder bee, Bombus ruderarius; and Shrill carder bee, Bombus sylvarum). The species has dark wings, but generally has a very yellow appearance, with a yellow-black-yellow thorax and large yellow patches on the sides of the abdomen, sometimes so extensive that the entire abdomen can appear yellow, with a narrow black strip along the top. At the other extreme, melanic (all black) individuals are not uncommon. 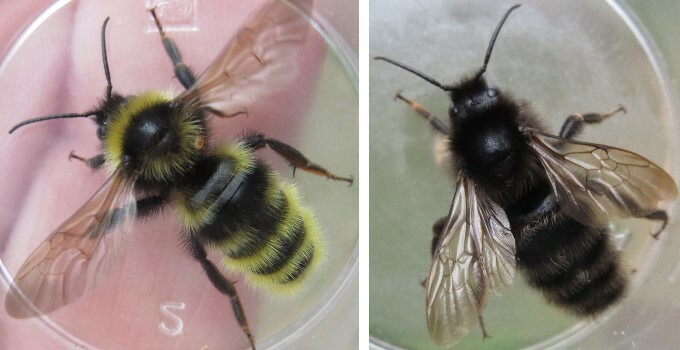 Male Field cuckoo bumblebee (left), Melanic form of Field cuckoo bumblebee (right). Photo credits: James Riall. 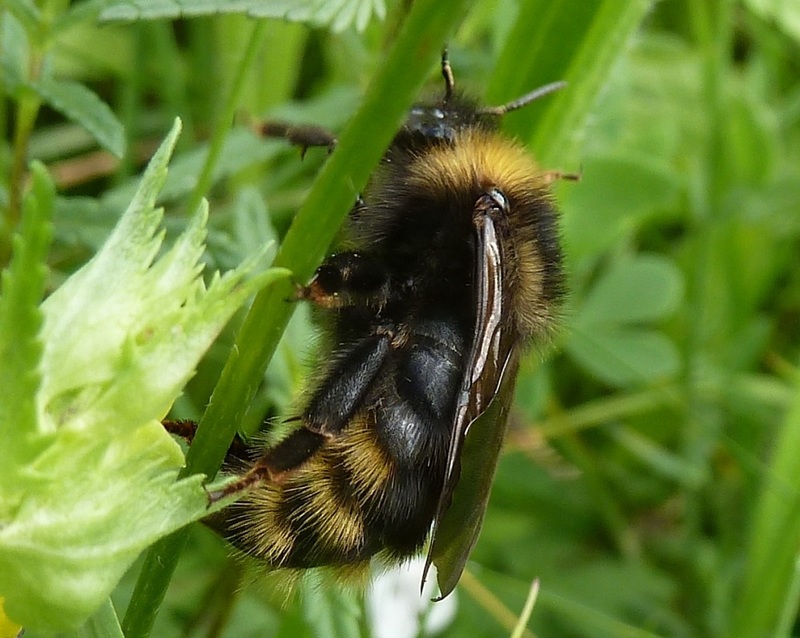 Males can be rather similar to males of the Forest cuckoo bumblebee (Bombus sylvestris), but have black hairs at the tip of the tail rather than orange.